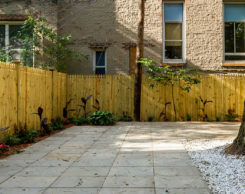 Purchased by the Fund as an outdated 3-family property, this property located on 2nd Street presented a prime opportunity for the Dixon Projects team to convert a rundown historic property into a grand single-family residence. Given the property is located in the Harsimus Cove Historic District, the finished product had to adhere to the stringent guidelines of the Jersey City Historic Preservation Commission, with the exterior needing to be restored to its original aesthetic. 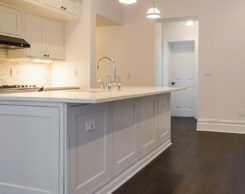 To comply with the historic guidelines and to return the exterior of the property to its original glory, the Dixon Projects team restored the façade to its original brick surface, while also replacing the rundown front door with a historic entryway and restoring the ornate apron to its once pristine condition. 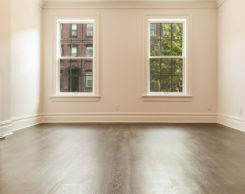 The expansive interior of the home, which is over 3,200 square feet, now features 3 bedrooms and 6 full bathrooms, along with a den, playroom, and office area that can be also used as an additional bedroom. 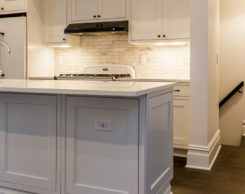 The team left nothing to be desired on the interior renovation, finishing the property with 7” wood flooring, replacing all windows, and installing custom, English-made cornice mouldings in the living, kitchen and dining areas. 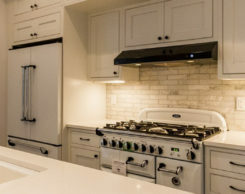 The designer kitchen features custom all-white cabinets and appliances, and its open-concept layout flows seamlessly into the accompanying parlour level living and dining rooms. 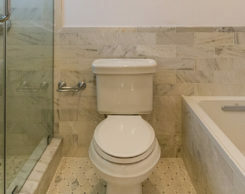 The bathrooms all feature unique tiling, vanities, and fixture collections, as well as radiant heat flooring. 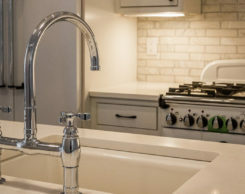 Completed in August of 2014, the property was an overwhelming success on the rental market, with prospective tenants in awe of the quality of the renovation.